With Reservoir Dogs and Pulp Fiction already in his back pocket there was immense anticipation prior to Jackie Brown’s release. Therefore it was a bit of a head scratcher that Tarantino chose to adapt a script rather than write one of his own, even though the source material was from renowned crime writer Elmore Leonard. Jackie Brown (Pam Grier) is a 40 something stewardess, worried that her advancing age has left her prime in the rear view mirror. This is only exacerbated when she is nabbed by the cops after returning from an overseas flight. It is not the cash that has the DEA up in arms, but the drugs. Jackie swears black and blue that she is being framed, but with no-one to give evidence otherwise she is sent to jail anyway, but not before being told that ‘this can all go away if you give us Ordell’. Ordell (Samuel L Jackson) is a loquacious and egotistical small time criminal, who among other things sells guns to anyone that will pay for them. It was Ordell that Jackie was holding the cash for, and it is Ordell that she worries about once she gets out of prison. For his part Ordell is a realist, he understands that eventually the DEA will either pressure Jackie or cut her a deal too good to refuse. So he would rather sacrifice Jackie than run the risk of that occurring. As he can’t get to Jackie while she is in prison, Ordell arranges as a ‘goodwill gesture’ to have bail bondsman Max Cherry (Robert Forster) arrange for Jackie’s release from prison. Jackie knows that if she does nothing Ordell will kill her. She knows that if she stays quiet she will do time, and will be released a middle aged woman, jobless, prospectless, alone and pushing 50. All of these things worry her. As with all Tarantino films the principals all converse with each other quite a bit. The DEA are fronted by Ray (Michael Keaton) and Mark (Michael Bowen), with whom Jackie meets frequently. Jackie also meets with Max Cherry frequently, even after his initial duties are dispensed with. For the most part Ordell sits on the couch watching TV and playing with his nifty rat-tail of a beard, talking to Louis (Robert De Niro) and being alternately aggravated and intrigued by part stoner, part surfer girl Mel (Bridget Fonda). With such an all star cast it is no wonder that the many dialogue scenes crackle. Pam Grier is great as Jackie, as is Robert Forster as Max, and the spark between the two becomes central to the film. The film is deliberate but never slow, clever but not cocky. Unfortunately it is also good but not quite great. 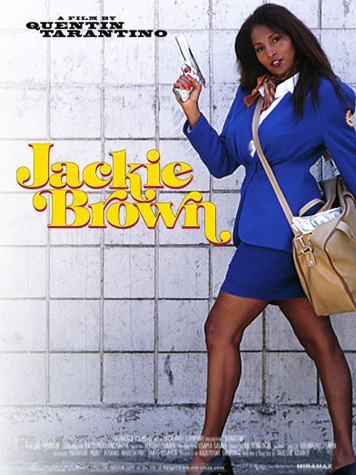 The fact that it differentiates itself from early QT works by eschewing the flashy editing and back and forth timeline ignoring structure is refreshing, however ultimately Jackie Brown is lacking that special something to elevate it alongside such exalted company as Reservoir Dogs and Pulp Fiction. It boasts a few scenes that crackle, some performances that shine and a strong plotline on which to hang these elements from, but it isn’t quite the work of magnificence that Tarantino no doubt believes it to be. As the last word though Tarantino outdid himself on the soundtrack though, it bests those other more celebrated compilations hands down. Final Rating – 8 / 10. For mine Jackie Brown is the last filmmaker up and comer Quentin Tarantino made, before he became ‘all time great’ auteur Tarantino, and started prefacing the titles of his films with indulgent crap like ‘The 4th film from Quentin Tarantino’. This entry was posted in Film, Movie Reviews, OGR Recommends, Sam M-F Jackson, Superstars, Worthwhile Movies. Bookmark the permalink.